Alright, I lied a few posts ago when I declared that the cherry granita was the last cherry recipe I would post during this year’s cherry season. 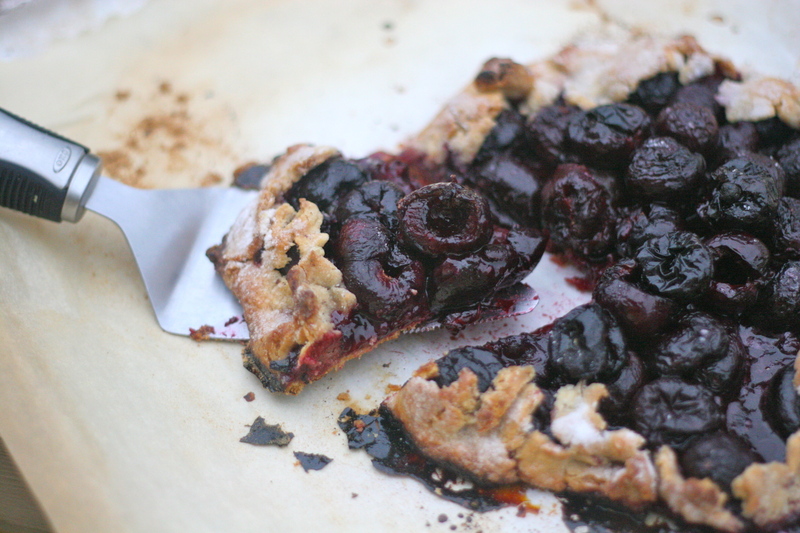 I still have a couple of pounds of cherries left and I craved a cornmeal crust cherry galette. While I love pie, and certainly ate my fair share of it growing up since my mom is the pie queen, I gravitate more towards open pies like tarts, galettes, and crostate. I do not have a definitive reason for why I prefer them except that they are less fussy–in my opinion–because there is only one crust to deal with. Related to the single crust issue is how the fruit in the galette behaves during cooking. It tends to caramelize better and release its juices better than in a double crust pie. I somehow imagine the fruit in a tented pie steaming and boiling, as opposed to a galette’s juices, which bubble around the edges and caramelize. The uppermost fruits–whether apricots, peaches, pears, or cherries–deepen in color and crispen a bit. For me it’s the same effect as roasting vegetables with an aluminum foil tent, or roasting them with no lid at all. Butternut squash, for example, becomes mushy in the former, and perfectly cooked, yet sweet and lightly darkened in the latter. Finally, in what seems to be me taking a stance for open-tarts, the galette is better adapted to other fillings like frangipane, pastry cream, and custards as a backdrop to the fruit. And you do not need to fit the crust into a pie pan–simply cook it at whatever size you like on a cookie tray. My galette differs from a traditional one because of the crust I have developed. I have mentioned this elsewhere, but unless I am really seeking the flavor of unbleached white flour, I do not use it automatically in every recipe. My galette dough is no different. Over the years I have adapted my favorite cornmeal crust recipe to include a bit of whole wheat pastry flour and corn flour as well. 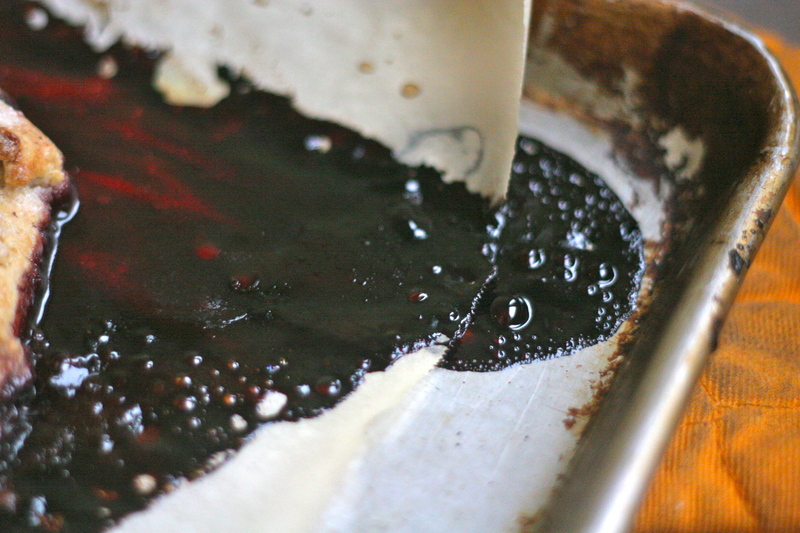 Delicious cherry juice that caramelized on the parchment. The crust results in something that could truly stand alone as a (not-very-sweet) cookie dough for the rich flavor and texture that results from the mix of these whole grain flours. I cannot get enough of it. For a spur-of-the moment dessert, I usually make a double batch. 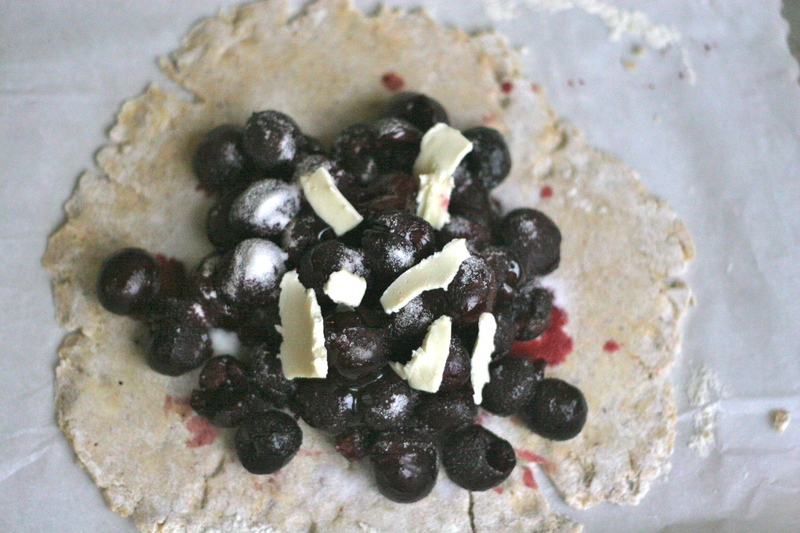 I make one of the galettes that night and then freeze the other dough for when I am really pressed for time, but MUST HAVE A DESSERT (which is pretty much every night). Don’t forget to brush the edges of the crust with either cream, milk, or water and then sprinkle some Demerara or regular sugar over it. It adds a lovely sweet crunch. 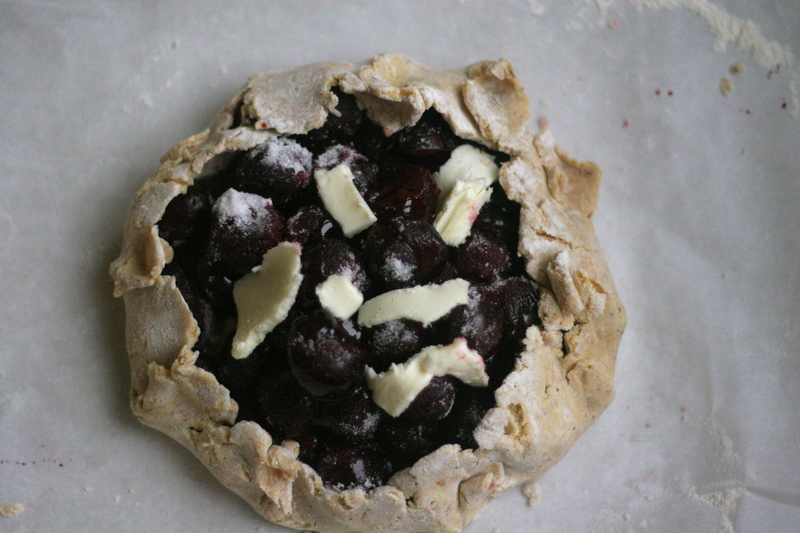 And I can vouch that this cherry galette has met its soul mate in apricot kernel ice cream. (Makes two 9 inch galettes). To prepare the crust, whisk the flours, cornmeal, salt, and sugar together and then add the tiny butter cubes. Using two forks or a pastry blender, incorporate the butter into the flours until little pea-sized lumps form. In a little bowl combine the ice water and creme fraiche. Slowly pour this into the flour-butter mixture, stirring with a fork until a shaggy dough forms. Knead the dough four or five times in the bowl and then pour it out onto a lightly floured surface. Unless you want to make one very large galette (in which case double the filling above) separate into two equal portions. Pat each portion out into two four or five-inch disks and then wrap well with plastic wrap. Freeze one for another day and refrigerate the other for at least and hour. Preheat the oven to 385F degrees. 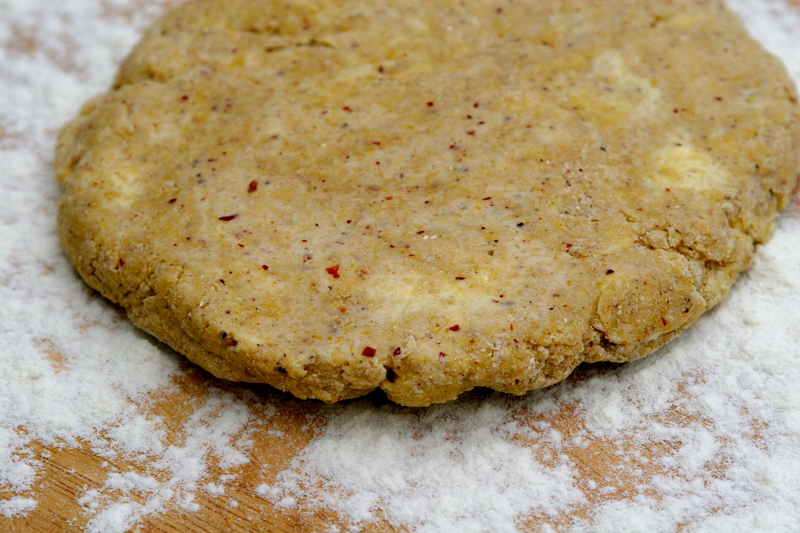 Roll out the dough to an 8 or 9 inch circle and carefully place it on a parchment lined cookie sheet. If the dough is too thin, it will crack and the filling might come oozing out, but if it is too thick you will not get the lovely cookie crunch of the crust. Leaving a 1 1/2 to 2 inch border, lay the pitted cherries in the middle with the tablespoons of sugar, honey, and butter sprinkled over the top. Carefully fold up the sides, gathering them bit by bit and pinching the folds. With a pastry brush, brush the edges of the galette until wet and then sprinkle the remaining sugar over it. Cook for about 35 or 40 minutes, turning half way. Enjoy with softly whipped cream or apricot kernel ice cream. 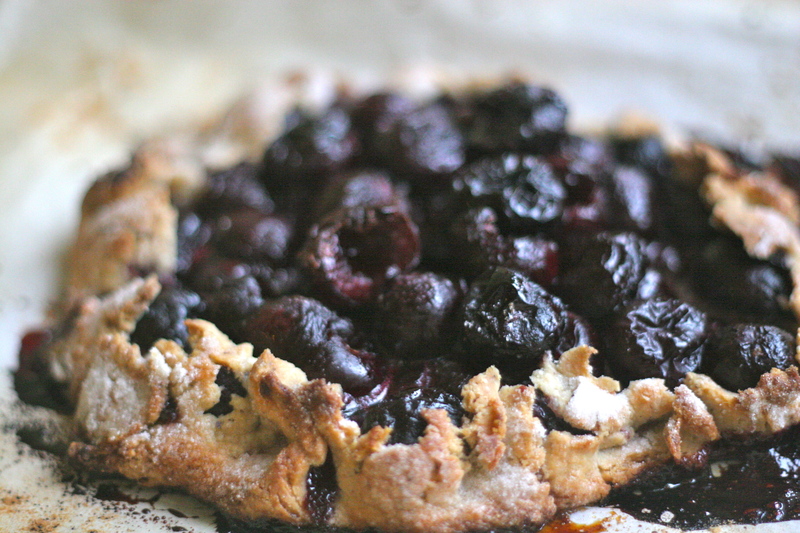 This entry was posted in Cherries, Dessert, Rustic Fruit Desserts, Uncategorized, Whole Grains and tagged cherry galette recipe, cherry galette recipe with whole wheat flour crust, cherry galette with whole grain crust, cherry tart with cornmeal crust, fruit galette recipe. Bookmark the permalink.